The ICA Facility, not Paris. If you haven’t played Hitman yet, newly independent developer Io-Interactive has a treat for you, as it has made the first section of the game completely free. The ICA Facility location has two story missions, two escalation contracts, over 40 challenges, 17 achievements, and you’ll also be able to see all the associated cut-scenes. If you decide to buy the game after playing, all your progress will remain. Plus, there’ll be a 60 percent price drop on the whole first season running for one week, in case you needed more incentives to play. “I’m proud to announce that our first hello as an independent studio is to invite all gamers to play the beginning of Hitman for free. There is a lot of love out there for Hitman and with this offering we hope that many more will fall in love with the game. We believe that this is Hitman at its best. So jump in and give a try.” said Hakan Abrak, CEO of Io. Square Enix decided to part ways with Io back in May, and the studio went fully independent and gained full rights to the Hitman IP last week. While it may not be a proper expansion pack, Diablo III is in line to receive some major new content very soon with the Rise of the Necromancer pack. This DLC, the core component of which is the new Necromancer class, finally has a release date and is slated to launch on June 27. The pack is priced at $15 and will be available following the release of the 2.6.0 update on PC, PS4, and Xbox One. Console players who don’t yet own the game can pick up Diablo III: Eternal Collection, which bundles the pack with the existing Ultimate Evil Edition. This carries a price tag of $60 but will be available for a limited time for $40. Blizzard did not specify how long this introductory pricing would last for. Rise of the Necromancer adds the Necromancer class, which is based on the fan-favorite one from Diablo II. It can be played in both the campaign and Adventure mode like any other character. The pack also includes a number of other, less significant components, most of which are previewed in the video above. There’s a non-combat pet, set of cosmetic wings, banner customization options, portrait frame, and pennant. Players also get two more character slots and stash tabs, although the latter is only available to PC players. All of this will be accessible once the Rise of the Necromancer pack goes up for sale, which will be once maintenance on June 27 is complete. You can see the exact schedule for this here; on PC it starts at 10 AM PT / 1PM ET in North America and at 11 PM CEST in Europe. On consoles, it starts at 8 AM PT / 11 AM ET / 5 PM CEST. Even if you don’t purchase the new pack, you’ll still be getting new content with the release of the 2.6.0 update next week if you own the Reaper of Souls expansion. The Shrouded Moors and Temple of the Firstborn zones, the Realms of Fate, and Challenge Rifts all release for free as part of the patch. 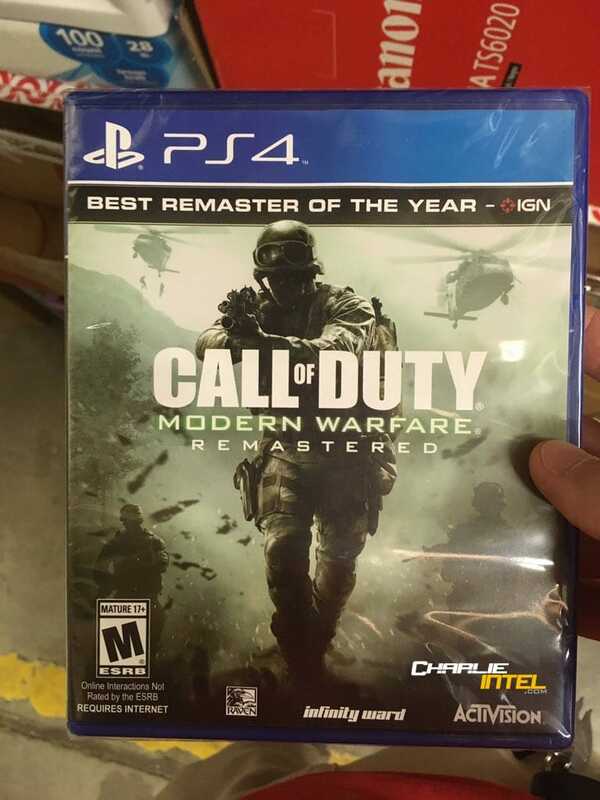 New leaks suggest that Call of Duty: Modern Warfare Remastered – previously only available with certain Call of Duty: Infinite Warfare special editions – will be released as a standalone, boxed game. According to CharlieIntel, retailers have already begun receiving boxed editions of the game (you can see an image below). Various reports suggest the game will be receiving a surprise release either today (June 20) or next week, on June 27. US retailer Target has also apparently listed the game at $39.99 in-store. IGN has contacted Activision for comment, but received no response at time of writing. Activision’s decision to re-release the much-loved game exclusively as a bonus for Infinite Warfare drew much criticism. It has provided updates since release, from returning modes to classic maps and new personalisation options. Joe Skrebels is IGN’s UK News Editor, and he is All Ghillied Up right now, just in case. Follow him on Twitter. Project Rap Rabbit, the rhythm-action game from the creators of PaRappa The Rappa, Gitaroo Man, and Elite Beat Agents, has failed to meet its Kickstarter funding goal, raising just £162,057 of the £855,000 it was asking for. Despite the seemingly definitive end to Project Rap Rabbit, iNiS J and NanaOn-Sha indicated they haven’t given up on the game entirely and that recent meetings at E3 may help give the project a future. “Though our Kickstarter campaign hasn’t gone the way we’d intended, our early stages of development have left us more determined than ever to bring Project Rap Rabbit to life. While you didn’t see Project Rap Rabbit at any conferences or booths during E3 week, we had a very, very busy E3 filled with meetings about our vision for the future of rhythm-action. The game was set to follow Toto-Maru, a rabbit and farm boy, and his sidekick Otama-Maru on their quest to save the world. The planet is becoming an increasingly hostile place thanks to “overlords.” The heroes needed to create peace by “embracing the strength of music and by using the magic of rhythm and rhyme.” The art style was inspired by 16th century Japan, and promised to blend traditional Japanese artwork and modern rap culture. Project Rap Rabbit was initially planned for release on PlayStation 4 and PC. The team later committed to making a version of the game for Nintendo Switch if they exceed their goal and raise $1.5 million. The Nintendo Switch has received its first substantial system update since launch, version 3.0.0. The update adds a raft of features designed to streamline or improve the experience of using the console and its menus (although many are features already included on other consoles). The update should automatically download, but if it doesn’t, just head to Settings > System > System Update. Among other things, you can now add friends who were previously on your 3DS and Wii U Friends List, receive notifications when friends come online and, in a lovely touch, make detached Joy-Con vibrate to help you find where you lost them. The update should also alleviate the problem where certain TVs constantly received notifications that the Switch had been plugged in via HDMI. The details were perhaps a little too dry to be included as a part of Nintendo’s brilliant E3 showing. Joe Skrebels is IGN’s UK News Editor, and he’s going to hide his Joy-Con in people’s desks and frighten them until he is fired. Follow him on Twitter.